The murder of a Bristol man three years ago by a mental health patient could not have been prevented, an inquiry has found. Stephen Newton, 44, of Carlyle Road, Greenbank, Bristol, was jailed for life for his murder in 2008. 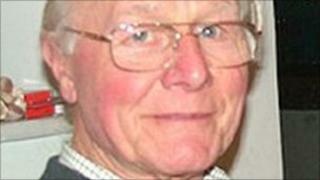 But Mr Hendy's family said the inquiry's findings was "seriously flawed and totally inadequate". At Newton's trial in October 2008, Bristol Crown Court heard Newton, who was high on amphetamines at the time of the attack, waited outside A and J News in Greenbank Road, for Mr Hendy to leave. He then followed the grandfather and stabbed him twice in the back and neck with a kitchen knife. He died in hospital a week later. The report identified a number of areas of poor practice and concern about the trust's procedures. It highlighted the trust's failure to assess risk and plan care properly. It also pointed to failures to treat drug and alcohol problems and it said records were "chaotic and incomplete". Hazel Watson, director of nursing at Avon and Wiltshire Mental Health Partnership, said: "This is a tragic case and everyone must feel deep sympathy for Mr Hendy's family who have had to come to terms with their loss. "Whilst we note that the independent investigation concludes that assessments made by our staff of Mr Newton were correct at the time and that there was no case for him to be detained under the Mental Health Act, we accept the criticisms made in the report of some of the procedures and practices which operated within parts of the trust at that time." Mr Hendy's son, Julian, 52, a documentary film maker from Leeds, was critical of the findings and maintained Newton should never have been free to walk the streets. He said: "Although today's report highlights a string of extremely serious failures by health care workers, shockingly it finds the killing was not preventable. "We do not accept this finding. It ignores the repeated, basic failings in care. We believe that had these failings not occurred, in all probability our dad would still be alive today." The mental health charity Sane said Newton had a history of mental illness, serial violence and abusing street drugs. Chief executive Marjorie Wallace said: "It is hard to imagine how much clearer the warning signs could be. Yet instead of consistent treatment for his drug and mental health problems, he was allowed to live in the community with minimal supervision. "The findings of this inquiry echo 600 similar cases exposing fundamental failures to assess the risk posed by severely disturbed patients and to protect the public."